We survived the first month of 2019! 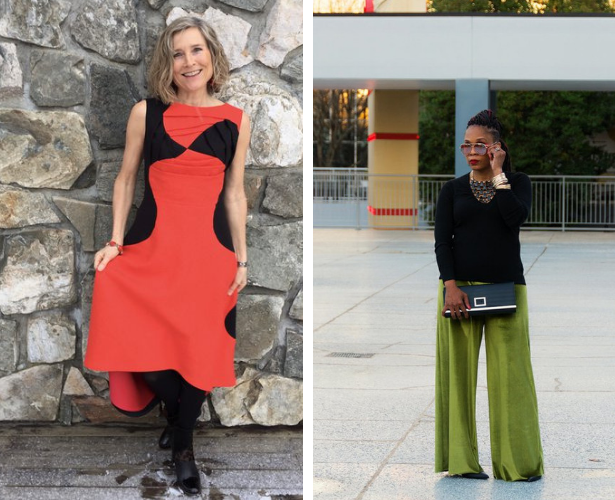 As I said in the December 2018 Round Up in these monthly post I’m going to share general and inspiring projects posts to both the projects page and Instagram. 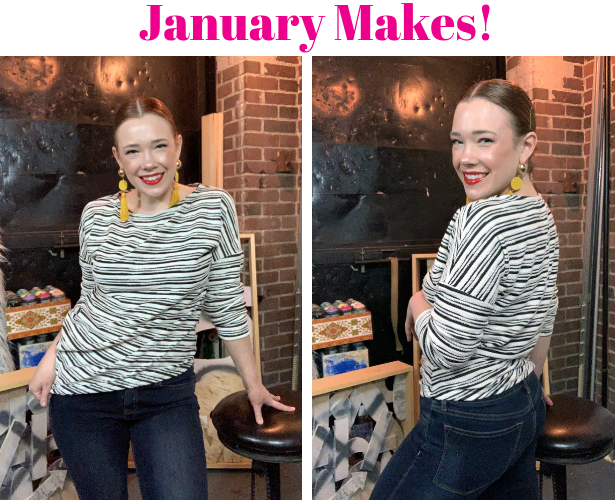 This month there were so many amazing projects sewn and posted, so I compiled them here with my makes in January as well as what I plan to sew this month! Member Mckellm sewed up this cozy structured sweatshirt and had fun picking out the colors while doing it! Then on the right we have groovymama in her fabulously chic brown wool coat. 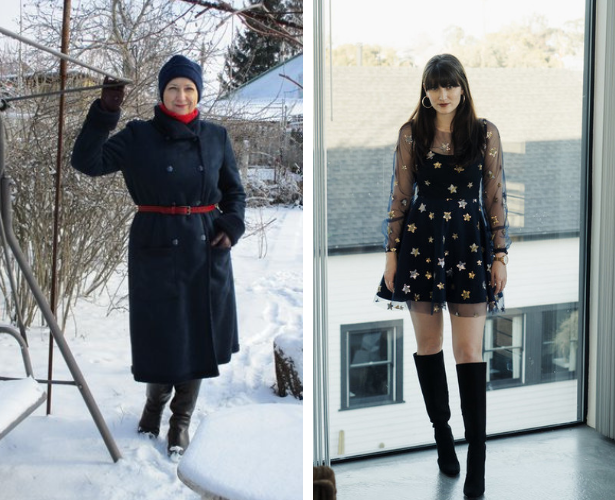 Oksana Starzhynska on the left sewed up a this dark blue faux shearling coat to keep her warm (and stylish) in this frosty weather. On January 1st member jaderbug posted her gorgeous tulle star dress that she wore on New Year’s Eve – and what a sparkling star! Member iluv2sew61 made this skirt the second time in suede – and I’d have to agree with her, it’s one of my favorites. On the right we have Elpida Kyriakou in her latest makes that complete a very nice and easy winter outfit. Ellen Hatteland on the left debuted this amazing origami dress which looks stunning in red and black. Then on the right we have member Angie H in her fabulous velvet wide leg pants, and of course I’m all about that green color choice! 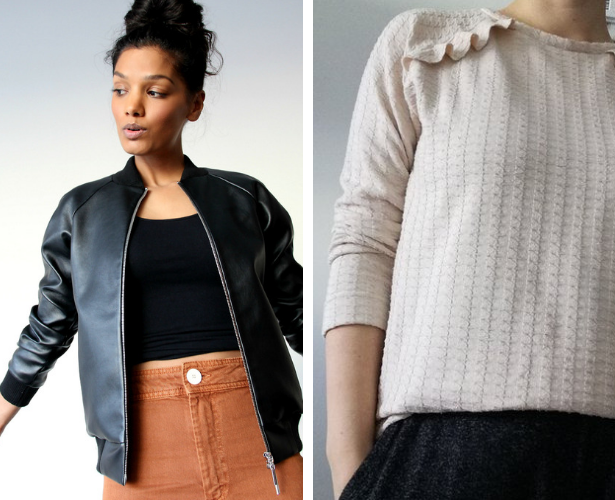 BurdaStyle influencer sramjit sewed up this edgy faux leather bomber jacket – and I love how lovely it looks from the wrong side, totally reversible! On the right we have first time project poster valerysd in her cute ruffle sweater. I always love to see that pattern sewn up. 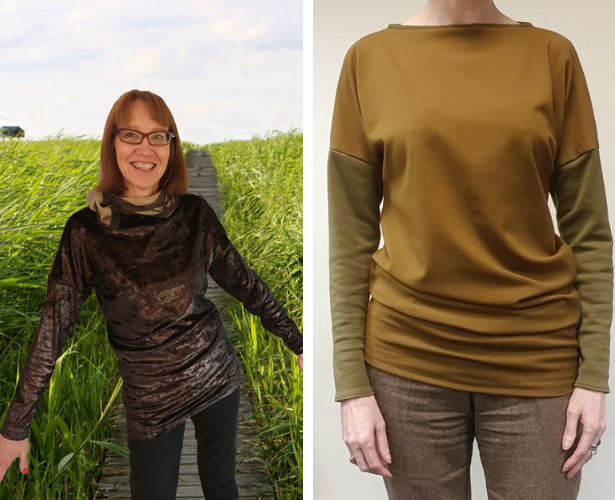 Members can’t get enough of our asymmetric top from the 02/2019 issue… On the left we have member Anne-Berit in her version made of metallic jersey, and then on the right member kazpaz in her top using double sided ponte roma fabric. 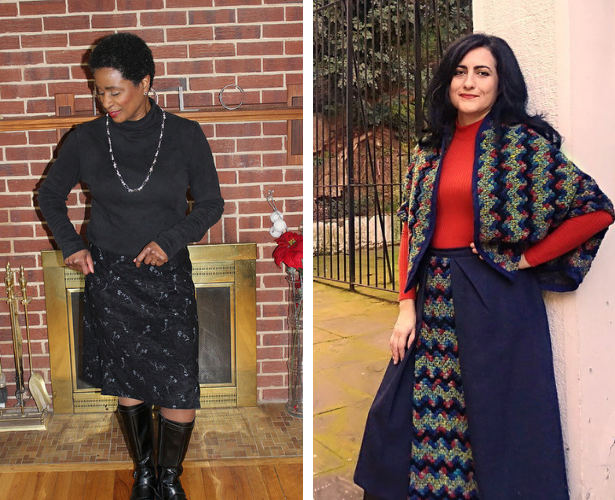 So let’s see what I was sewing in January – well not much aside from what I was making to take to film a new sew-along. I managed to complete my Mash Up, making our Twist Shirt but couldn’t get around to the tank. 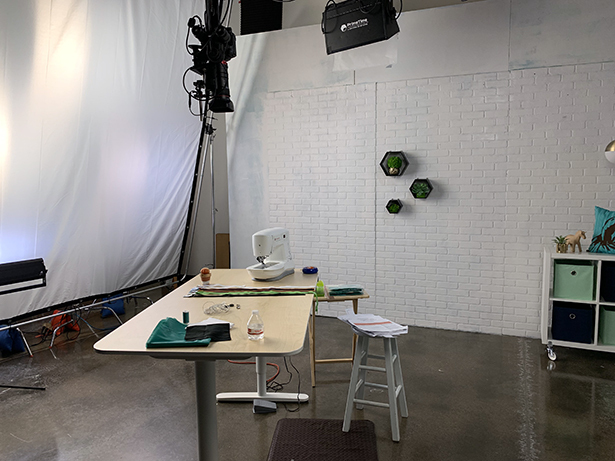 Here’s a little behind the scenes shot just as I was unpacking and starting to film two brand new free sew-alongs scheduled to start in the spring – so stay tuned for those! These film trips take a lot out of me, and it’s hard to get other sewing done – but it’s totally worth it in the end. So much fun to se on set sewing and the end result of an online course/sew-along where I can communicate with you all and teach is just amazing. You can find all our online sewing education here! So my Twisted Top Mash Up is really the only thing I completed – but it’s a nice and easy start to the capsule collection I want to achieve by the end of 2019 with all my Mash Ups. In February I’ll be able to get some serious sewing done, and hopefully make this tank pattern because I really need more layering tanks and I love the pattern! Then for my Mash Up I’m planning on sewing up this trench coat from the 02/2019 issue. I love the silhouette and the belted closure – and I don’t have a trench coat in my current wardrobe, so this one will be perfect. Now the real question is do I sew it neutral or bold? 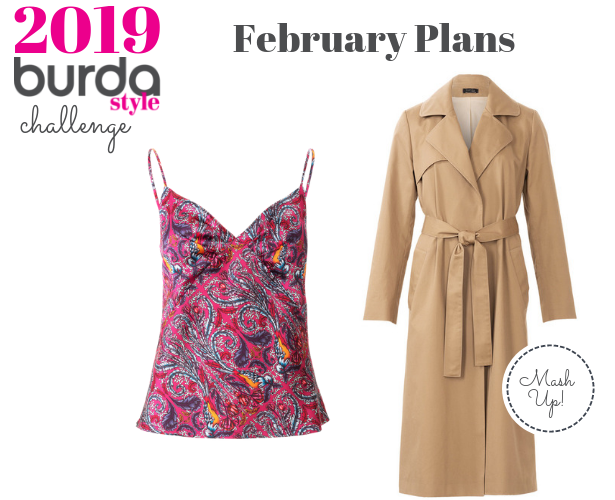 Post your makes on Instagram using #burdachallenge2019 or in the projects! 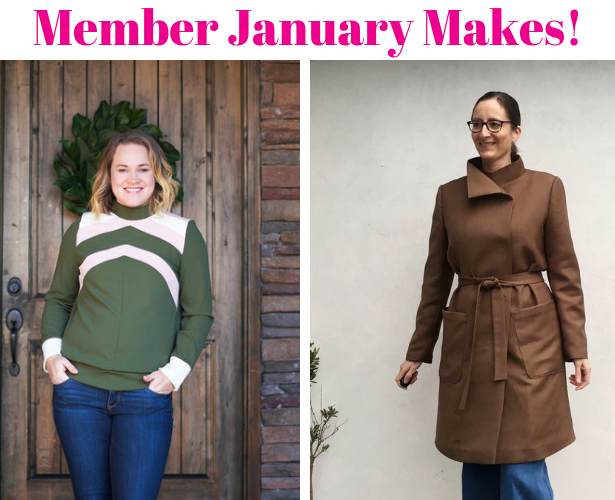 I love seeing what everyone is sewing each month and putting together these round up feature posts. I turned January’s features into a gallery as well that you can check out here. I’m so happy to see my first project here! I didn’t expect it! Thanks!